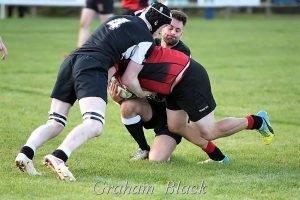 Linlithgow’s selection problems continued as two late call offs meant that coach Dougie Thompson had to start this game at scrum half. This meant that that in only 4 competitive matches this season, the Reds have had to field 40 different players! 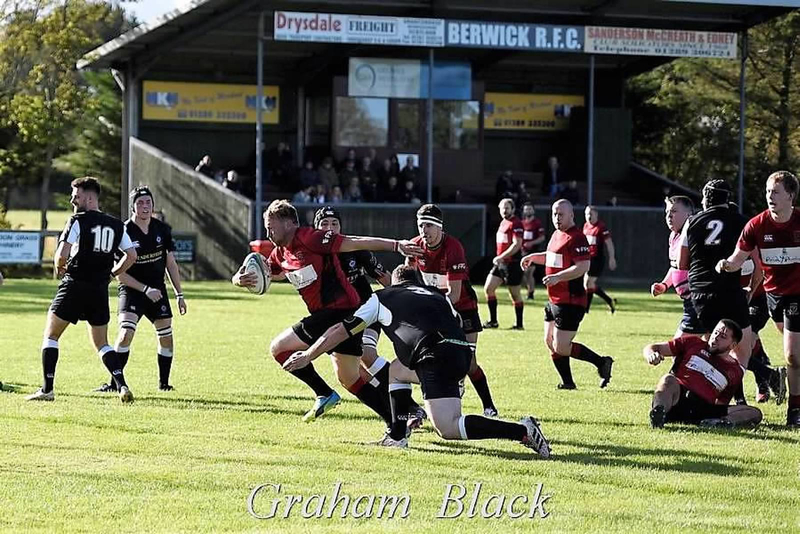 The Reds started the game reasonably well, matching Berwick in all departments, however the big difference was finding the try line. By the 25th minute Berwick had run in 3 tries, all in the corners, only one converted. While the Linlithgow try line was never really under pressure, every time the home side got the ball in the Linlithgow half they scored, whereas when Linlithgow had the ball in an attacking position, they either dropped the ball or it was robbed from them too easily. Linlithgow started the second half well, and put the home side under some pressure. Berwick lost their cool and ended up having 2 people in the bin. Linlithgow profited from this and veteran scrum half Dougie Thomson scored 2 quick tries from close in, both converted by Rab Cairns. This brought Linlithgow into bonus point range, but Berwick soon scored another in the corner which was converted. Once Berwick were back up to full strength they put Linlithgow under pressure and Ally McLean was binned for a high tackle. 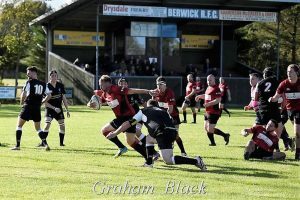 Berwick ran in a further 2 tries, both in the corner, one converted, to make the final score 39-14. The final scoreline flattered Berwick a little. Linlithgow will wonder how they managed to lose 6 tries, every one of them scored in the corner by a player who evaded a tackle. The injuries just keep piling up for Linlithgow as Euan Mochrie was helped off late in the game with a hamstring injury. Rab Cairns (captain); Ross Plenderleith, Mark Green, Ross Tulloch, Lewis Herdman; Aidan Rennison, Dougie Thomson; Matthew Sommerville, Colin Devlin, Ally McLean; Kieran Cochrane, Steven Grant; Euan Mochrie, Cal Thomson and Mark Caddle. Subs: Andrew Blyth, Lachlan McCall, PJ Singleton, Fraser Mochrie.